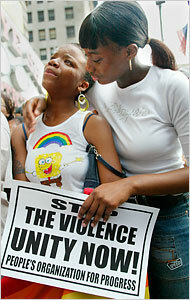 A documentary recounts the 2003 killing of Sakia Gunn, 15, a lesbian high school student in Newark. 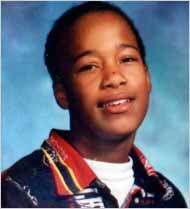 In 2003, Sakia Gunn, a 15-year-old lesbian high school student, was fatally stabbed in downtown Newark by a man who had approached her in the street and made sexual advances to her and her friends, which they declined. The case, which was prosecuted as a hate crime, drew widespread attention in gay, lesbian, bisexual and transgender communities, though considerably less news coverage than that of Matthew Shepard, the 21-year-old gay college student who was abducted, beaten, tied to a pole and left to freeze to death in Laramie, Wyo., in 1998. The film weaves trial footage with interviews; one of the earliest scenes depicts Mr. McCullough’s defense lawyer citing his relatively thin criminal history — a juvenile conviction for possession of marijuana — as a mitigating factor for the purposes of sentencing. Ms. Gunn’s death had a galvanizing effect on gay activists, and the film includes interviews with several: Laquetta Nelson, co-founder of the Newark Pride Alliance; Clarence Patton of the New York City Anti-Violence Project; and Bran Fenner of Fierce, a coalition of gay minority young people. Monika Graff for The New York TimesShanese Winston, 17, left, and Audrey Servance, 17, attended a vigil for their friend Sakia Gunn as officials observed a No Name-Calling Day on May 11, 2004, a year after Ms. Gunn was killed. A candlelight vigil held in Newark a year after the killing, in which dozens of community members gathered at the corner of Broad and Market Streets, where the crime occurred, highlighted the extent to which the gay population mobilized after the slaying — and sought the support of straight allies. At the vigil, Cory A. Booker, then a councilman and now the mayor of Newark, angrily asked why “there was not a national outcry” over the crime. As part of a plea agreement, Judge Paul J. Vichness of Essex County Superior Court sentenced Mr. McCullough in 2005 to 20 years in prison for aggravated manslaughter, aggravated assault and bias intimidation — less than the maximum penalty of 25 years. The judge said he considered Mr. McCullough’s lack of a previous criminal record a mitigating factor, but rejected the defense’s arguments that the circumstances leading up to the crime were unlikely to recur and that Mr. McCullough was unlikely to commit a crime again. The defense had initially argued that Ms. Gunn fell on Mr. McCullough’s knife during or after a scuffle, a version of events that prosecutors and Ms. Gunn’s friends disputed. “I don’t know why you didn’t walk away from this,” the judge told Mr. McCullough. Mr. Brack, who grew up in Chicago and manages operations at Third World Newsreel, an activist filmmaker collective founded in 1967, said he hoped the film would raise awareness about Ms. Gunn and her life and death.